This book is boringly written, but has a great message. It is about a high school social studies teacher that, in order to get his students to understand the Nazi party and Holocaust, creates a social experiment called The Wave. A motto is created, rules are created, members are identified as “monitors” so that enforcement of The Wave’s ideals are upheld, and even a salute is created. The Wave takes off like wildfire with the Seniors in the class, and they begin telling others about it. Then over 200 hundred students in the school become involved. People who resist, well, let’s just say, some members strongly discourage. One Jewish student got beaten up by members, friendships were destroyed, and those on the outside and saw The Wave for what it was, they became fearful to speak out or move against The Wave. The movement moved as one pack. A few students broke free and saw what it was doing. One student even attempted to push through and show others in the movement what was really happening. The Wave moved towards equality. Finally, everyone felt equal to each other. The cliques disappeared. Those who lived in shadows or constantly teased, were a part of a group. I think, experiments like The Wave and the Stanford Prison Experiment, are beneficial to society. It shows how impressionable humans are in their adaptability to something bigger than themselves. Some individuals, not because they are weak minded, need to answer to something greater to themselves. You find this in religion, in politics, in group/clique settings. We are pack animals. We need to belong. Do I agree with this structure? No. I am appalled that the Holocaust even occurred. Do I believe I would have stood out? I would like to say yes, because I always stand against what I believe is harmful, but you never know. There were some stronger characters in this book, but only some learned AFTER they hurt someone they cared about. This is a book I think my high school should have read at some point. I am not sure why it didn’t. I still feel kind of weird about what I read, and how to process these feelings. I wish the writing wasn’t so dry and that I could have been sucked into it, but I felt myself forcing through, just trying to get to how the experiment ended. I think the ending was too abrupt as a reader, and I am not sure if that would really work to end this kind of experiment. I may need to do some research on what happened to the kids AFTER the fact. Those who participated in the Stanford Prison Experiment were never the same, they were all effected by the roles that they were given and getting into those roles. As I was finally finishing this story, I showed my boyfriend some of the pictures and told him what this story was about. He asked me who it was by and I said Brom. He asked, “that’s his name?”…Yes. Brom is amazing enough to just go by 1 name. He does not need a full name. Is there an author that no matter what they publish, you will grab a copy and read it? Brom is one of those authors for me. I managed to snag a copy of this book, this is his second illustrated novel, on Amazon. They seem to be really hard to come by. I love Brom, my favorite is The Child Thief, a Gothic, dark retelling of Peter Pan. He has another novel coming out this year, which I am extremely excited about. The Devil’s Rose is a “short” story, only roughly 128 pages but jam packed with a beginning, middle, and end. The gorgeous Gothic art makes it that much more enjoyable. I always try to get people to read Brom, I share his posts on Facebook, if his books are on sale for Kindle (Though I suggest getting the actual hard copy). This story is a western Hell story, so if you have delicate sensibilities or do not want to read “Devil” stories, then this book is not for you. It mixes Western with Underworld. Cole is sent by a Fire Demon to catch Rath and several souls that managed to escape Hell to bring them back. Cole is a soul catcher, and when he does the Devil’s bidding, it is considered time served and eventually he hopes to be able to find the soul of his beloved in the afterlife. Cole, the Soul Catcher, former Texas Ranger who was shot down by deputy during a tirade at the Church when his beloved Rose killed herself. He collects souls that have escaped Hell. Rath. The god that escaped Hell with a few other souls at the beginning of the story. One of the guardian demons in Hell. Escaped demons that took over the flesh of some living humans that were camping. Another series I have been trying to finish out, but never seeming to make time for it…. The Third installment to the Jane Jameson series by Molly Harper. One of my mother’s favorite authors. This installment had to be my favorite out of the 3 so far. In this particular story, Jane, again, finds herself in some of the most bizarrely interesting situation. She becomes this psycho girlfriend thinking that Gabriel is cheating on her with another vampire. The other vampire uses insight to make Jane believe that he is actually cheating on her, and Gabriel does not, again, delve into what he is doing or why. Again, Jane finds herself in a predicament that is life or death. And again, Jane prevails…but why wouldn’t she? I am sad to know, that the conclusion of this series comes with the 4th installment. There is SO much that still needs to happen for any kind of closure. Even though I have given this book a rating of 3 stars, for me, it is more of a 2.5. I have been wanting to read this book for a while, however, I felt myself having to push through it. I almost quit reading it. The writing style is not my type. I couldn’t get into Gone Girl for very similar reasons. I figured out who the killer was, even though the author tries to throw you off. I figured out what ailed Morgan to end up getting her killed. It was, to me, predictable…which is a big reason I stopped reading mysteries. This book was very slow and very hard to get into. I know a lot of people have given it rave reviews, and maybe my review will get tossed to the side and ignored. However, I read this with a few friends and we all felt the same way. I don’t want to give away any spoilers, but this is a story about a drunk who rides a train to a job she no longer has so her roommate doesn’t start to worry about rent. The train stops outside houses where drunk used to live. Every day said drunk sees one couple at their home (sometimes just the woman). Every day train goes by, and drunk creates a life for the people she sees at that happy home. Then one day, drunk sees something else. At first, I the reader, thought maybe she witnessed the attack, but no, that is not it. The drunk also has many black out episodes, and she struggles hard with sobriety trying to figure out what exactly she saw during her last blackout. Did the drunk see something on the day that Morgan went missing and was killed? Will people believe her? Who do you think did it? The husband? An ex? The therapist? Some other random person in her life? Can you figure out who it was? My least favorite character was Anna, the new wife of the ex-husband of the drunk. Rachel (the drunk) and Anna were at odds. The man in question, Tom, cheated on Rachel with Anna during the marriage and then Anna got pregnant, Tom divorced Rachel, and moved Anna in and got married rather quickly. Rachel tried stealing their baby once. She will call in her blackout states, email, etc. Struggling to hold on, struggling to let it go. Anna and Tom live on the same block as Megan, the girl who ultimately goes missing. You will have to give it a try for yourself to see if it is enjoyable. If this is your kind of writing style, then there should be no problem. But if you need some excitement, through the whole story, and not just the last 50ish pages, then this book may miss it’s mark completely. This is book 2 in the Jane Jameson series. I read the first one in 2014, and enjoyed it immensely. I got my mom hooked on this series and pretty much every series written by Molly Harper and she has listened to every single audiobook out there in existence of Molly Harper’s. I was a little disappointed with this book. I felt there was so much action and drama to get through, this book just kind of fell flat for me. I felt there was too much back and forth drama between Jane and Gabriel that was annoying and I would have given up on a LONG time ago. I felt what was going on with Zeb could have had a bigger impact or plot thickener than what it was. I was also a bit turned off by Jane’s family and am HOPING this changes. I also felt it was unjust that the Grandma felt the way she did about Jane…but in light of the discoveries Jane made…Grandma wasn’t upset or dissuaded with her own life possibly on the fringe of ending. For most of the story being based on Jolene, I felt like there is still more to know about the family and I wished it would have gotten into it on a deeper level. Amanda Ronconi is a great narrator and delivered again in the sequel to Nice Girls Don’t Have Fangs. I am looking forward to making my way through the rest of this series and I hope that the unanswered questions left dangling in this book, will be answered soon! Unlike in Charming, the Knights Templar have a bigger role. You meet more Knights, including the very head honcho who puts John Charming up to an ultimatum: his life, and his friends’ lives be spared, if he infiltrated a wolf pack, and brought a human/knights killer to justice. And by justice…he means death. Be prepared for just as much wit, fighting, betrayal, and humor as the first book. If you make time for the books, they are pretty quick reads due to their humor and story flow. There is not a lot of stalling in the story, and everything progresses at a normal, expected speed, with not really any filler or bits of information that if removed from the story, would not have altered it. Everything part in this story was necessary for story to progress appropriately. And like the first book, I still picture that hunk John Charming being played in my head by Joe Manganiello! mmmm mmm mm! My boyfriend and I listened to this book together on the way to Mississippi from good Ol West Texas during the Thanksgiving holiday. It is not typically a book I would read, or be interested in, (Between what he had said about the book and others who have heard about it, I did ultimately put it on my TBR list for a later date,) but my boyfriend had been wanting to listen to it (he is not big on any books really), so I decided to listen with him. I want to admit, the entire time I was listening, I kept thinking about Sheldon Cooper and Will Wheaton’s issues on Big Bang Theory. This book, in case you didn’t already know, is about video games. And not just any video game, but a video game that pretty much took over Real Life. There were actual jobs that people could get in the Oasis video game, and when the work day was over, they simply left the simulation. When the game’s creator died, he left a challenge for the players, a way to inherit EVERYTHING he owned. This story was about the Main Character, Wade Watts’ journey through the game to his ultimate winning of the game (no this is not a spoiler, he even talks about it in the beginning of the book). Even though I knew Watts would win, I found myself anxious in some parts because it just didn’t seem probable for him to win. Watts had everything going against him. Including multiple near death experiences. I can’t really compare this book to anything else I have ever read, because I haven’t read anything quite like it. I enjoy Science Fiction/Dystopian novels from time to time, most are usually overplayed, but this one is completely different. I liked that it is a gamer’s dystopian and not just the normal run of the mill rundown country that destroyed itself. Yes, the world in 2045 is not the same we know today, but it is still functioning in some capacity. I am not much into video games, but I probably would have gotten into this hoopla found in Oasis. Sounds like my kind of game! I don’t want to go much further into a review, one, I really don’t feel like I am capable of giving away much more than what I have due to possible spoilers; two, because I have never read this kind of book before, I am not sure how to address my feelings of the overall book. I enjoyed the book. I feel it deserves the rating provide by myself, but also the overall rating it has on Goodreads as well. I think Wheaton did a great job narrating it, made it worthwhile. I have been on the fence about another book Wheaton narrated, but now that I have heard his skills, I will give other books narrated by him a try. Ultimately, it comes down to this. I enjoyed listening to this book with my boyfriend while we made the 30 hour round trip drive. It combined both of our loves, my love of reading, and his love of video games. It was something we could do together and talk about. I was given this book by the author through AudiobookBlast dot com in exchange for my honest review. This book went kind of slow at the beginning and I found myself questioning where it was even going. After the four leprechaun brothers arrived at Colin’s home, the story picked up pace and I found myself laughing and enjoying the book. This book is uniquely original and can get through it pretty quick. 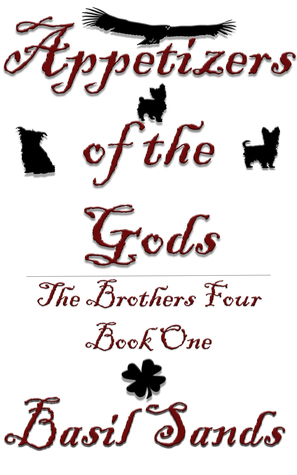 I found each of the 4 brothers to be enjoyable and I loved when they were interacting in the story. I liked how each character brought something to the overall plot.